Mikaela Shiffrin won a Gold Medal in Sochi today. She is the reigning World Cup and World Champion in Slalom - and has become the youngest person ever to win Gold at an Olympic slalom event. Shiffrin is shown in the above image (L) earlier today next to Silver Medalist Marlies Schild (Austria). 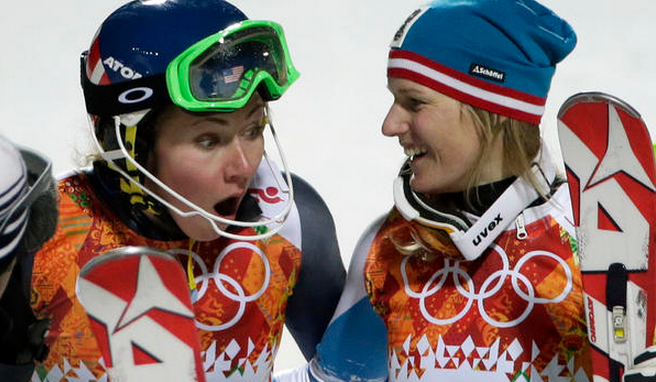 The surprise on Shiffrin's face is sincere. Note how widely her eyes are opened here. Her mid-face is also stretched as her mouth and eyes are opening very wide. When people feign surprise they will open their mouth somewhat widely - however this is nearly always with a greater horizontal component. However, notice how Mikaela's mouth is open more widely VERTICALLY. Moreover her teeth are not visible. Although there are exceptions (when other emotions are co-existing) neither upper nor lower teeth are almost never visible during SINCERE surprise - thus if teeth are visualized - the surprise is almost always fake.